STEP 1. Visit Product Search on racetech.com, or call our helpful sales staff at 951.279.6655 to see what Race Tech offers for your bike. If nothing is listed, don't worry, give us a call - we develop new setups nearly every day. - Option A: RT Hi-Performance Springs - The first step to great handling is selecting proper spring rates front and rear. Proper rate springs are the most cost effective upgrade in most cases. Springs are available for most fork and shock applications and restore proper ride height and balance to your bike accounting for rider(s) and baggage weight. - Option B: RT Hi-Performance Springs & Gold Valve Kit - The next level of suspension performance is adding a Gold Valve Kit (or Gold Valve Emulators) along with proper rate RT Hi-Performance Springs. Gold Valves are designed to provided a plush feel with drastically improved bottoming resistance; and each Gold Valve install comes with a personalized setup geared for you, your bike, and your type of riding. 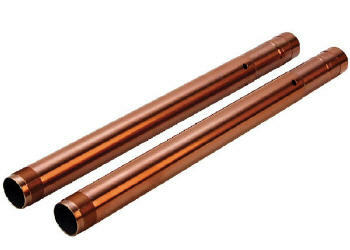 Gold Valves are available for the forks and shock in most cases (substitute Gold Valve Emulators in the forks in some cases). This option provides amazing performance for slightly more than the cost of springs. - Option C (Shock): G3-S Custom Shock - G3-S Custom Series Shocks are 100% customized and personalized shocks built to replace your stock shock. G3-S Custom Series Shocks combine RT Hi-Performance Springs and Gold Valves with an industry leading shock body. This setup is the most expensive, but offers the great benefits of Springs and Gold Valves along with increased adjustment and customization. For models with non-rebuildable stock shocks, G3-S Custom Shocks may be the only shock option from Race Tech. - Option C (Forks): G2-R Cartridge Kit & RT Hi-Performance Springs - Mostly for pavement applications (but we can make some pretty cool vintage dirt cartridges. This is the top of the line upgrade for your forks, G2-R Cartridge Kits are often used to improve upon stock cartridge design adding performance and adjustment. G2-R Cartridge Kits are the most costly fork upgrade, but offer the most in performance and tunability. - Additional Upgrades: Race Tech also offers a full line of suspension related items. Choose from replacement parts like seals, bushings, and TNK Fork Tubes, to the best Coatings on the market. Race Tech also offers suspension tools to help with installation. STEP 3. After you have selected your upgrades, it is time to choose how you would like to have your Race Tech components installed. - Option A: Ship your suspension to Race Tech - Want to have our suspension pros install your suspension upgrades? Take the forks and/or shock(s) off your bike, ATV, or UTV; fill out the Customer Service Request form, and ship them to Race Tech, 1501 Pomona Rd., Corona, CA 92880. Check out this easy shipping guide if you have any questions or need a suspension box from Race Tech! - Option B: Visit your local Race Tech Center - Race Tech has many authorized installation Centers around the World. If you prefer to work with someone local, find your local Race Tech Center on this page and contact them about scheduling your suspension upgrades. Many local dealers also install Race Tech components. - Option C: Do it yourself - Purchase your RT Hi-Performance Springs, Gold Valve Kits, Ultra Slick Suspension Fluid, or parts that you need and install the components yourself. Feel free to call our Tech Support line (951.279.6655) to determine the tools you need or if you get stuck and have a question!